Ben Harper was one of Rock Island’s early leaders and entrepreneurs. He came to Rock Island in 1850, at the age of 33. By 1854, he was elected mayor, and he also served president of the Board of Education. In 1870, he built the Harper House, a five-story luxury hotel with 100 rooms and elegant public spaces, on the southwest corner of what is now 19th Street and Second Avenue. Perhaps it was the success of the hotel’s large auditorium that saw appearances by national stars, including Sarah Bernhardt, Mark Twain, Buffalo Bill and Tom Thumb, that provided the motivation for Ben Harper to construct another magnificent building, the Harper Opera House. The Opera House name did not mean the same thing it does today but rather referred to any theatre that accommodated live entertainment. The construction of the four-story Opera House on the northwest corner of 16th Street and Second Avenue was announced in December of 1877. It was designed by local architect I. N. Holmes to have retail space on the street level with the theater facilities upstairs. In the early 1880s, C. C. Knell opened a furniture store here. Knell was young, eager, and inventive. In addition to running his store, he also manufactured a chair of his own design in the basement factory and managed the upstairs theater for Mr. Harper. Mr. Knell is credited, at least locally, with creating the first reclining chair, a chair which would lead to the throne of so-called couch potatoes throughout the country. The chair he created in 1883 was similar to modern recliners in that it had an adjustable back and a retractable foot rest. The similarity ends there. 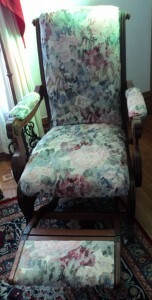 An exposed carved wood frame ensured that Knell’s chair would be esthetically compatible with the Eastlake parlor suites popular at the time, but also meant that the chair would accommodate only a small amount of soft upholstery. The back and seat, connected with metal hinges, were covered with lightly upholstered cushions. 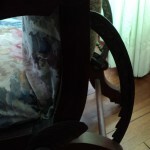 A rod, which slipped into metal notches, supported the back as it tilted to various angles, operating much like the later Morris chair. Each armrest had a light pad. 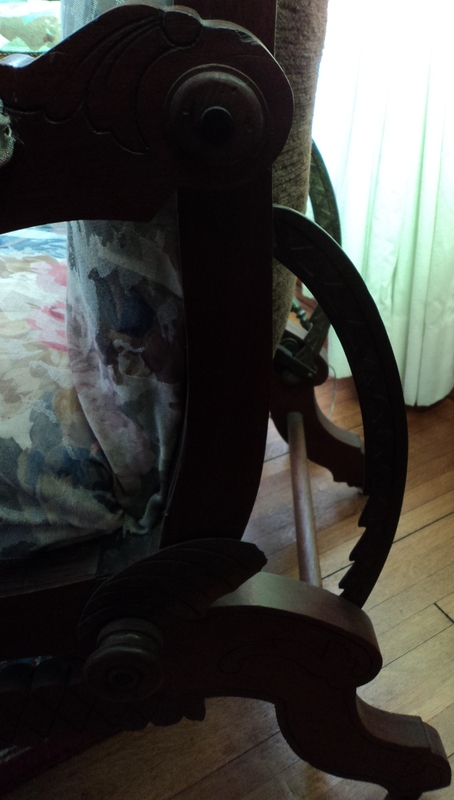 There was a small upholstered footrest supported by notched wooden brackets, which pulled out from beneath the seat. These reclining features made the chairs much more comfortable than the typical straight chairs of that time, which accounts for reports that Knell sold them throughout the world at a price of $10. However the moveable design and the nearly all-wood construction methods made them rather rickety and fragile. It’s uncommon to find one of Knell’s chairs in an antique shop today. After C. C. Knell died in 1887, his furniture selling and manufacturing business was sold to two former employees, Hans Clemann and Louis Salzmann. These men built a company which would remain in business for decades under their family’s ownership, although they did not continue manufacturing Knell’s chair. In 1901, Clemann and Salzmann were able to purchase the Opera House for $30,000, and, when the theater closed the following year, expanded their business into the entire building. Then, on January 15, 1917, they were hit by the disaster shown on this Real Photo postcard from the Special Collections at the Augustana College Library. The blaze started in a defective flue in the basement of the adjacent Des Moines Beer Company (four-story building near right on postcard), where it was first confined. Then it spread upward to the space beneath the roof and from there extended sideways into the Clemann and Salzmann store, whose corner is visible at the far right. The fire continued, burning the furniture company downward from the fourth floor. A headline Argus story proclaimed the “most disastrous blaze in city in years ruins two businesses and buildings.” The story also said that the $161,000 fire was allowed to extend into the Clemann and Salzmann building because Rock Island did not have an aerial truck. Both Moline and Davenport sent their aerial trucks, which can be seen on the postcard, but apparently too late to prevent the damage. A month after the fire, the owner of the beer company building, B. D. Connolley, announced that he would erect a new building. Clemann and Salzmann were able to save their store. 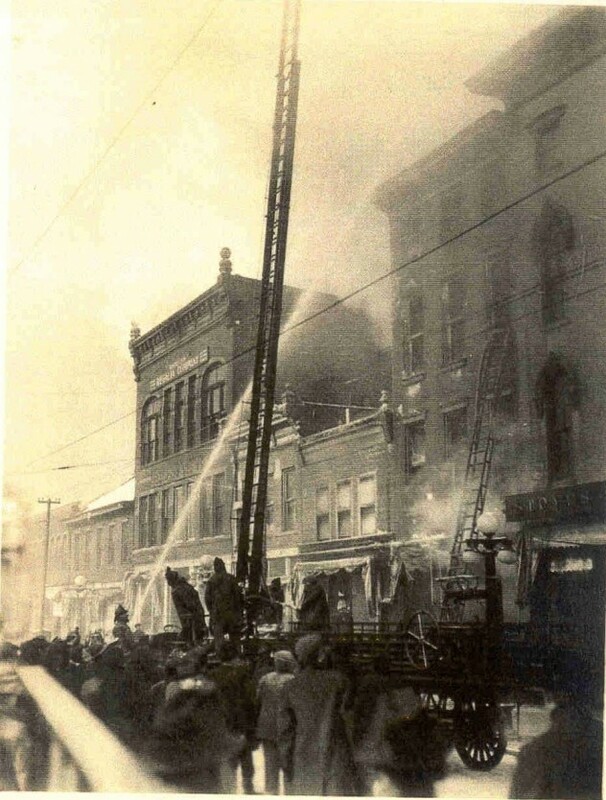 At the time of the fire, their furniture, called the “best in the middlewest in point of size of stock and quality of goods,” was valued at $60,000, while the building was valued at $75,000. Fortunately they had blanket insurance that covered 90 percent of their loss. They were able to repair the damage, which was mostly confined to the interior. Salzmann and Clemann and their descendants continued their business at this location until 1952, when it was sold to the Edwards brothers, who had owned automobile agencies in Rock Island and Moline. The brothers continued to sell furniture. The historic Harper Opera House, by this time called the Clemann and Salzmann Building, was home to an active business until 1960, when it, along with the entire block, was demolished for a new on-ramp to the Centennial Bridge. This article, by Diane Oestreich, is slightly modified from the original, which appeared in the Rock Island Argus and Moline Dispatch on February 5, 2006.